This morning Tony was coming home to collect me and take me to hospital but had to rubberneck at the crowd gathered at the Community Centre in j'ville. Four fire engines, a number of police, tape and hundreds of onlookers. 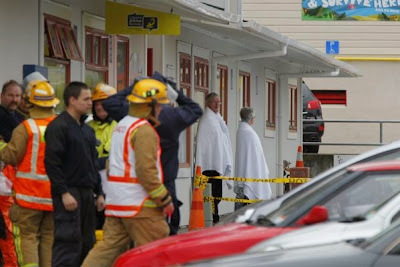 We didn't realise till this afternoon that this was all sparked by a letter sent to Peter Dunne's office (which is at the community centre) that contained white powder. The poor electorate office worker got the whole "could be anthrax" treatment - isolated office, chemical showers, cordons etc. testing showed substance to be baking powder. By the time that was confirmed I suspect her quiet day at the office was totally ruined. Peter Dunne was not at the office - perhaps combing his hair at home? So this was Johnsonville scene this morning. - not as you will remember our suburban home! Gerry Brownlee suffered same fate - but that wasn't near us! !